Great start and looking forward to whats to come. Protagonist is entertaining and the fighting sequences were very well executed by using strategy and skill instead of just overwhelming power like most anime these days. Even after the first episode I can say i'm looking forward to see further interactions between the protagonist and the sword princess. TL;DR : Fun characters, great fighting sequences, and a meh plot. I'm interested to see whats to come. Alright, so this series, starting up at the first episode is great. It takes its style from the Aztecs/Mayans which is hardly ever done in anime. Other than the art, the characters are great. It has its charming main hero who claims to be the strongest man in the world, and proves it. On top of that, he has a very unique style of fighting compared to most main anime characters, which is they have super powerful moves. He uses his tricks and surprises his enemies to beat them rather than just simply being stronger than them. I got a little carried away so ill give a little plot run down. There are 6 heros throughout history that are referred to as braves, and our main character desires to be one of these to fight the demon god. Did I mention there is a cute bunny girl? well there is. Should You Watch This Show? Plot: Simple and linear. Bit of a force-feed in the beginning. Unique Traits: The main protagonist is a very technical fighter. You don't see many fights that utilize various items and utilities to overcome opponents. Its a fresh type of fighting thats more clever than just brutish sword-swinging. Personal Opinion: Maybe with animation that is more fluid, this would be more captivating. The plot seems rather simple, so there's not much twists to expect and theres a high potential for getting side-tracked on the journey. Overall: Short-term commitment. Not expecting to be amazed. The First episode and I'm already eager for more. Its full of potential and there seems to be room for Epicness, Romance, and great action. Hope it doesnt disapoint, although I doubt this will be anything less than another awesome show! It represents the new kind of today's anime. ok this episode gave me a lot of vibes from akatsuki no yona and that is not a bad thing the action scenes were really well put together the story of the episode was really nicely paced the main characters look like they are going to work well together i'm thinking maybe there will be a romance between the pair the voice actors did a great job bringing the characters to life but what really stood out for me was the quality of the animation it was really brilliant lets hope this show keeps up the greatness. To be honest, this series shows promise. After having watched the first episode, I can seriously say that they have an original setting, original characters and most important of all, an original story. Of course, this could all change in the future, but I hope it won't. 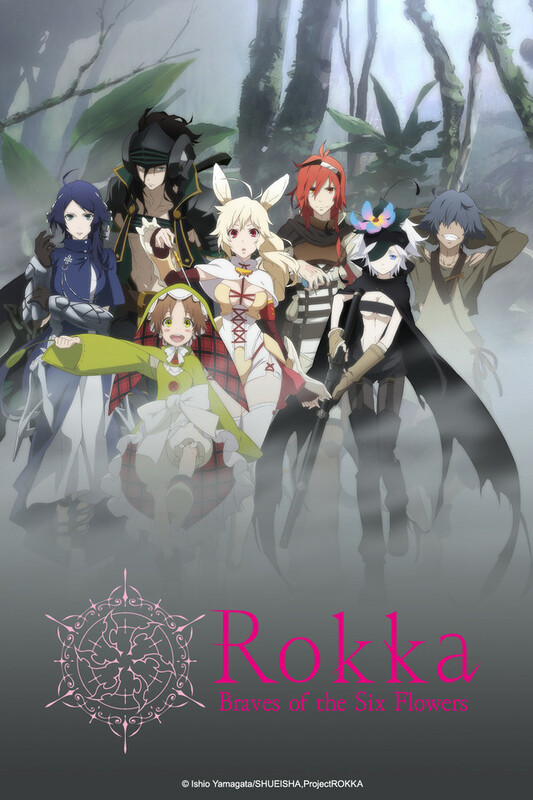 Rokka: Braves of the Six Flowers - Great Start! The first episode was great and went far beyond my expectations! It's style is kind of like Aztec/Mayan vs Magical World. It shows a lot of promise and an original plot. But most of all, I am really looking forward to seeing more fighting scenes. It has a great fighting style using strategy rather than absurd amounts of power. If you're into action, it's a must-see simulcast!